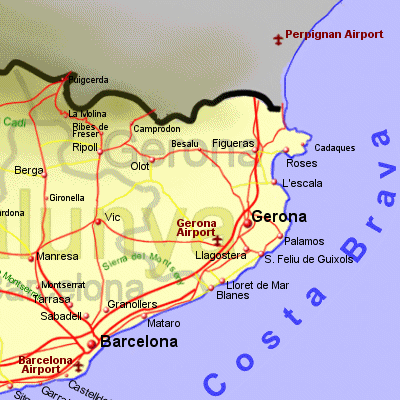 Located in the north east corner of Catalunya (and of Spain), could be said to have it all. Some of the most attractive coastline on the Spanish Mediterranean (the Costa Brava, or Rugged Coast), ski resorts in the Pyrenees, plenty of history and interesting architecture, and stunning National and Natural Parks. The province is by no means new to tourism but has remained civilised. The Costa Brava coastline is typified by rugged coves with sandy beaches and pine trees adjacent to the beach. There are many holiday locations along this coastline: Blanes, Lloret de Mar, Platja d'Aro, L'Escala and Roses being amongst the best known. The Pyrenees in Gerona province has been home to ski resorts since the early 20th Century, La Molina having its first ski hotel in 1925, and Spain's first ski lift in 1945. There are now 4 ski resorts in Gerona province: La Molina, Masella, Vall de Núria, and Valltar, each with its own character. Figueres, being the birth place of Salvador Dalí, and to where he later returned and died in 1989, is home to the Dalí Theatre Museum, which houses much of his work. The capital city of Gerona shows evidence of its Medieval Moorish, Roman and Jewish past, having many ancient buildings to visit, including the cathedral, dating from the 11th century, and having the widest Gothic nave in the world. Also of note is the exceptionally well preserved Jewish Quarter, the multicoloured houses on the banks of the banks of the river Onya, the 12th century Sant Nicolau church, the footpath along the old city wall, and the Arab Baths.